CORYDON EXTRAVAGANZA is a two-day curated VINTAGE, JUNK & ARTISAN Festival that celebrates all things rusty, dusty, timeless & awesome! Corydon Extravaganza is the place to be for vintage finds, unique antiques, and one of a kind repurposed goods. Make sure to come hungry and thirsty! 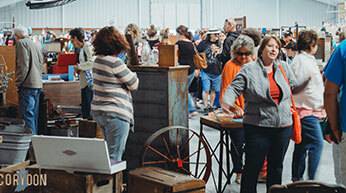 We also offer the Southern Indiana Food & Wine Fair!! Come out and experience a great selection of Food Vendors, Indiana Wineries & Live Music all while shopping the 200+ vendors at the Corydon Extravaganza- Vintage, Antique & Art Market.See ya soon! The discounted rate only applies if you call and mention the "Corydon Extravaganza."